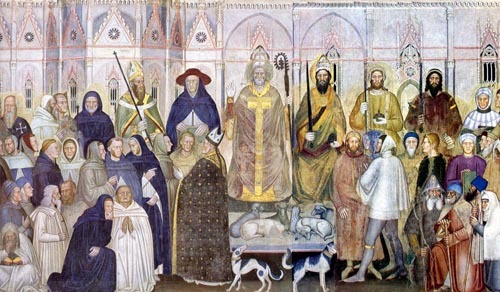 St. Gregory VII, Pope and Confessor. By his teachings and action he affirmed and defended the rights of the Pope over the Church, and of the spiritual over the temporal sphere. He was an example of intransigence, courage, and confidence in the supernatural. It’s a pity that I didn’t remember to bring here a document attributed to St. Gregory VII that is attacked by all the progressivist theologians. It is called Dictatus Papae (1090), which means the The Dictates of the Pope. It is a kind of summary he dictated of the theses he wanted to uphold. Among those theses, one of the most beautiful and habitually shunned regards the relation between the Pope and the Emperor as head of the temporal sphere. The Emperor at the time, Henry IV, was intervening in Church matters in order to direct her through the control of the election of the Bishops. St. Gregory VII fought against this. He wanted to smash this pretension of the imperial government and humiliate it, and in fact he did so. The Dictatus Papae shows his thinking on the relations that should exist between the Holy Roman Empire and the Papacy. He affirmed that the Papal Monarchy is a universal monarchy in spiritual matters. In temporal matters the Papal Monarchy should decisively influence the Empire, even without governing it directly. The temporal power should be the sword of the Pope, at his service to protect the Holy Catholic Church, defend the Faith, and persecute its enemies. The temporal power should govern its subjects independently according to natural law, but the Papacy should watch over how this is done. There would be two different and independent powers. Which one would be the highest power? At the top is the Pope, and at his left, one step down is the Emperor, and below the Emperor, all the Kings and sovereigns of the temporal sphere. Also below the Pope and to his right is the entire Catholic Hierarchy in the spiritual sphere. In synthesis, everything relies upon the Pope. This was St. Gregory VII’s conception of the two powers. We might ask St. Gregory VII on his feast day to intercede for the world so we might again have this conception of the spiritual and temporal orders. On the day when this again becomes the general view, it will be the dawn of the Reign of Mary. The reverse is also true: on the day that the dawn of the Reign of Mary will arrive, this vision will be born with it. Let us pray to St. Gregory VII to move God to bring back his sublime vision on earth, because without it nothing can find the right path.